In the last cabinet reshuffle before the 2015 general elections, Prime Minister David Cameron has dealt a few surprise hands. Here's our round-up of the changes announced this morning. Michael Gove has been replaced as Education Secretary by Nicky Morgan (who will also be Minister for Women and Equalities). Morgan was formerly Financial Secretary to the Treasury and Minister for Women. Gove has been demoted to Commons chief whip. Andrew Lansley has been replaced by William Hague as Leader of the Commons. Lansley has announced he will step down before next year's election. Hague will remain as first secretary of state, but has resigned and will also step down as an MP in 2015. William Hague has also been replaced by Philip Hammond as Foreign Secretary. Hammond's former role as Defence Secretary will be taken by Michael Fallon, previously Business Minister. Home Secretary Theresa May and Chancellor George Osborne both retain their posts. Matt Hancock replaces Michael Fallon as Business Minister. He was formerly Minister for Skills and Enterprise. Owen Paterson has been replaced by Liz Truss as Defra Secretary. Stephen Crabb has replaced David Jones as Welsh Secretary. Crabb was previously Parliamentary Under-Secretary of State at the Wales Office and a government whip. Esther McVey will remain as Minister for Employment and Disabilities, but will also attend cabinet. Greg Clark has replaced David Willetts as Minister of State for Universities and Science. Clark will also hold on to his current role of Minister of State at the Cabinet Office. Willetts will leave the government and Commons. Tina Stowell (Baroness Stowell of Beeston) has been appointed Leader of the House of Lords and Chancellor of the Duchy of Lancaster. An unwilling Lord Hill has been nominated as European Commissioner, but finally managed to successfully resign Leader of the House of Lords. Jeremy Wright has replaced Dominic Grieve as Attorney General. Wright was previously Prisons Minister while Grieve will leave the government. Other ministerial sackings include Kenneth Clarke, formerly Minister without portfolio; government chief whip Sir George Young; Energy Minister Greg Barker; Foreign Office Minister Hugh Robertson; and Minister for International Development Alan Duncan. All will leave the government, while Barker will also leave Commons. Mike Penning replaces Damian Green, sacked as Minister for Policing. Green will leave the government. Penning was previously Disabilities Minister, but this role has been incorporated under McVey in her new role. Nick Boles, former Planning Minister, has got Matt Hancock's old job as Minister of State at Education and BIS. Part of his brief will also be equal marriage. Mark Harper, who quit as Immigration Minister earlier this year after discovering his cleaner was an illegal immigrant, has been appointed as a Work and Pensions Minister. David Gauke, former Exchequer Secretary, will take over Nicky Morgan's role as Treasury Financial Secretary. John Hayes is to becomes a Transport and Cabinet Office Minister. Anna Soubry has been promoted to the Minister at the Ministry of Defence from Defence Personnel, Welfare and Veterans. Oliver Letwin will become Lord Privy Seal as well as retaining his existing job of Minister for Government Policy. Priti Patel has been appointed Exchequer Secretary at the Treasury. Clare Perry has become Parliamentary Under Secretary of State at the Department for Transport. Amber Rudd, a former whip, has joined Department of Energy and Climate Change. Penny Mordaunt will become a junior minister at the Department for Communities and Local Government. Nick Gibb, who lost his job in a 2012 reshuffle, will return as Minister of State for Schools. Julian Brazer joins as a Defence Minister, while Robert Buckland will replace Oliver Heald as Solicitor General and Desmond Swayne becomes an International Development minister. George Freeman will join as Minister for Life Sciences. Andrew Murrison has replaced Andrew Robathan as Northern Ireland Minister. Brooks Newmark will become Minister for Civil Society, replacing Nick Hurd, who will leave government. Brandon Lewis has been promoted to Minister of state at the Department for Communities and Local Government. Ed Vaizey will move on from being the Under-Secretary for Culture, Communications and Creative Industries to minister at the Department for Culture, Media & Sport. Jo Johnson (brother of Boris), who was Parliamentary secretary, Cabinet Office, and head of the Downing Street policy unit is now Minister of state at the Cabinet Office as well. Tobias Ellwood is a new appointment as Junior minister in the Foreign Office with responsibility for Middle East and North Africa. Sam Gyimah will be Junior Education Minister, and Alun Cairns is a government whip and Parliamentary Under-Secretary at the Wales Office. Four new assistant government whips have been appointed — Ben Wallace, Therese Coffey, Mel Stride and Damian Hinds. 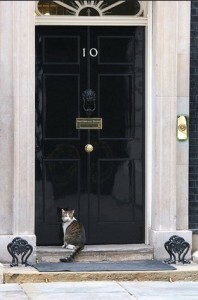 Larry the cat remains in his role as Chief Mouser to the Cabinet Office. In other reshuffle news, the New Statesman takes a look at the split between male and female Cabinet-attending ministers, while the Telegraph speculates on Nicky Morgan's chances of winning back people alienated by Gove. The BBC have listed the other ministers staying in their current jobs, including Health Secretary Jeremy Hunt, Justice Secretary Chris Grayling and Work and Pensions Secretary Iain Duncan Smith. Photo by nottheviewsofmyemployer in the Londonist Flickr pool.